After a break of ten years, former Angel Dust vocalist Dirk Thurisch finally returns with his band MERCURY TIDE, which once started as a project and now grew to a full-fledged band. The new album “Killing Saw” is a natural progression from Dirk‘s last album “Why”. Eventually the time has come that one of the most important German Melodic Metal vocalsists returns like a Phoenix, rising from the ashes! 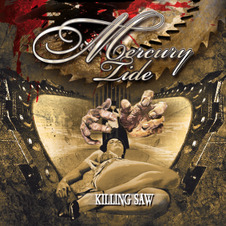 The new masterpiece “Killing Saw” is released through Limited Access Records on May 25 in Europe and July 10 in the USA. It was recorded and mixed at the CKB Recording Studio by drummer and producer Carsten Rehmann (Japanische Kampfhörspiele, Kreator, Harasai). The one and only Eroc (Matt Roehr, Mystic Prophecy, Firewind) takes credit for mastering, which one can hear by the sound‘s wrecking ball heaviness. In Japan this album is available on amazon Japan on May 29.